For those of you tempted to give your Christmas turkey a bath before the big day, STOP. This is madness, what were you thinking?! I don’t want to be a party poo-per, but really there are more entertaining ways to spend those xmas hours than sitting on the toilet, aren’t there? And that’s just what could happen to a whopping 80% of the British turkey eating population this year according to the Food Standards Agency in the UK. 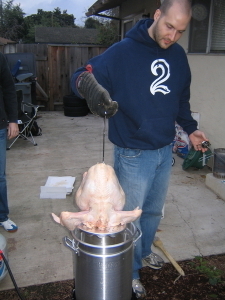 The splashing about that turkey carcasses do in the sink while being bathed before the big roast on Christmas morning can spread potential foodborne pathogens such as Salmonella, Campylobacter, Listeria and Clostridium as far as the water they’re washed in can reach – over the Brussels sprouts and everything, thus putting the family’s vegetarians at risk too. Just have a look in the CAB Abstracts database for amazing snippets of useful (and sometimes worrying) information. The search for ‘turkey and foodborne diseases’ is quite a simple one for a change – just right for this stressful time of year. Among my own personal favourite are the USDA-ARS’s 1993 paper1 on controlling Clostridium botulinum in uncured turkey meat by means other than salt – a paper well ahead of its time. Salt is one of the simplest ways of controlling pathogens in raw meat. Then there are the outbreaks of ‘Norwalk Like Virus’ (NLV) and hepatitis A that were tracked down to samples of cooked meat, including turkey, in 2000, by experts and Johns Hopkins University in the US2. And these guys were only developing a testing method! Also in 2000, the Danes – more specifically a group of veterinary microbiologists at the Royal Veterinary and Agricultural University in Copenhagen discovered that lack of hygiene in turkey processing plants was even adding Listeria to uncontaminated carcasses3. It is the season for giving, I suppose! And I haven’t even mentioned bird flu! If you’re going to do your own search, just remember to use ‘turkeys‘, rather than ‘turkey’. Otherwise you’ll be limiting yourself somewhat geographically. The FSA are clearly as concerned as I am about the unpleasant things we can get from turkeys. Not only have they recruited two top celebrity chefs to record a series of radio ads on the subject, they have set up a turkey-specific email hotline. So don’t have nightmares – and the very best of the season to you all! 1 Miller et al. (1993). Comparison of organic acid salts for Clostridium botulinum control in an uncured turkey product. Journal of food Protection 56(11), 958-962. 2 Schwab et al. (2000). Development of methods to detect ‘Norwalk-like viruses’ and hepatitis A virus in delicatessen foods: application to a food-borne NLV outbreak. Applied and Environmental Microbiology 66(1), 213-218. 3 Ojeniyi et al. (2000). Comparative investigations of Listeria monocytogenes isolated from a turkey processing plant, turkey products, and from human cases of listeriosis in Denmark. Epidemiology and Infection 125(2) 303-308. Next Article Could blue be next year’s green?